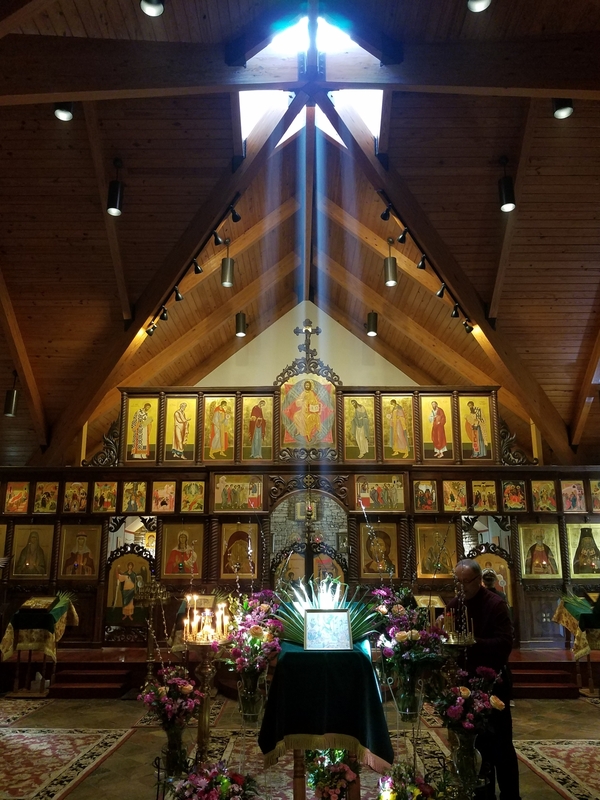 We are a parish of the Russian Orthodox Church, a part of the worldwide Orthodox Church founded by our Lord Jesus Christ and spread throughout the world by His holy apostles and their successors. The Head of the Church is our Lord Jesus Christ Himself. In obedience to Him we are led by His Holiness, Kirill, the Patriarch of Moscow, and by His Eminence, Metropolitan Hilarion, First Hierarch of the Russian Church Abroad. The clergy appointed by our hierarchs to shepherd the parish are our two Rectors: Archpriest John Townsend and Hieromonk Alexander (Lisnichuk) along with Protopriest Dimitri Oselinsky, Priest Daniel Iliev, Priest Mikhail Beliakov, and Deacon Jude Rountree. The church is located in Roswell, Georgia, and our parishioners come from all parts of the metropolitan Atlanta area and beyond. We welcome visitors from all over the world. As part of the Orthodox Church we strive above all to unite ourselves to Christ our Savior. For this reason we are committed to the truth that He Himself embodied. We strive to follow the authentic and unchanged Holy Tradition given to us by Christ and His apostles for our salvation, and we welcome all who wish to take up the Cross of our Savior and join their efforts with ours in following Him. We also welcome all who are seeking the Church that teaches the unchanging truth proclaimed throughout all the centuries from the time that our Savior taught it and lived it on this earth to the present day, the Church that is united to Jesus Christ through an unbroken succession of those who proclaimed and struggled to live the life that He gave us. The services of our church are in English. It is our goal to share the saving Gospel of Christ in its fullness as it is proclaimed faithfully by the Orthodox Church alone. Whether or not you are ready at this time to make your commitment with us, you are most welcome to "come and see."